Two Weekends to have a Chance to Join Us! Canceled because of Poor Visibility / Performed Other Dives in the Area! If you haven't dived the Whale-back Thomas Wilson, here is your chance! It started out with our project leader not feeling so well and had to cancel his involvement in the project. 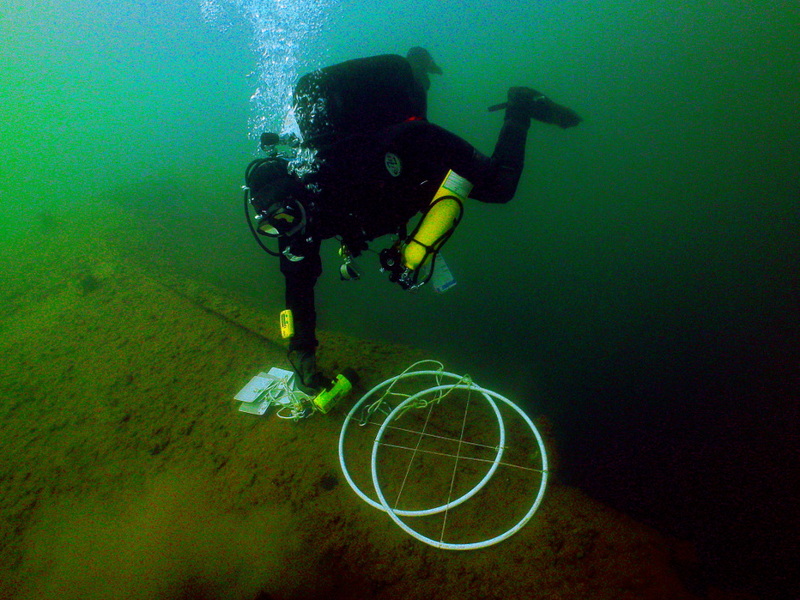 Unfortunately he had the tools we use to help us in counting the Zebra Mussels on the shipwreck and just couldn't connect to obtain them from him. We asked Corey Daniel to take over as the Project Leader and Phil Kerber remain Captain on-board the RV Preservation Research vessel. He would also help out as Co Project Leader. The weather was cold but sunny. Which is a good start on what we thought would be a great project. After a discussion with the participants of the project that the visibility might be really bad, we were still determined to dive the Thomas Wilson Shipwreck to attempt counting mussels that day. After securing the boat to the shipwreck the first dive team descended to the Wilson and discovered we were going to have very little visibility again like we discussed, and were disappointed. They continue to dive even though the visibility was 10 feet or less. They agreed the visibility was only 5 to 10 feet depending on where you were at on the shipwreck. We then all agreed that the project would be too dangerous to continue. So we discussed options. One option was to dive the Mayflower which was another 4.5 miles further out from the Wilson. We then motored to the Shipwreck Mayflower coordinates and dropped a diver in the water to attempt to find the subsurface buoy we installed years back. The diver (Steve Berres) couldn't find the subsurface buoy but did find the shipwreck. So he tied off his surface marker buoy so that we could Anchor and dive the shipwreck. We didn't want to actually hook the shipwreck because of a concern of damaging it. It is our protocol to not course any additional damage to our shipwrecks on the north shore or anywhere on the great lakes. So we anchored next to it in the sand. All participants wanting to dive the Mayflower dived it that day and said the visibility was 15 to 20 feet. We then motored back to Spirit Lake Marina for dinner. The next day we woke up and decided to try the Thomas Wilson again. In the past, we've had better visibility change in just one day so, we thought we would try it. After setting the anchor on the Thomas Wilson again the second team of Phil Kerber and Andrew Goodman descended to the shipwreck. They found that the visibility had gotten worse. They figured they only had about 1 to 2 feet of visibility and called the dive! We all then discussed our next move and agreed to the call the rest of the day and head for the marina, unload equipment, clean up and head for home. I guess we'll try it again next weekend for the next scheduled Thomas Wilson Invasive Species Monitoring Project. Even though we are disappointed by the diving and weather conditions, we still have a great time cruising and hanging out on the RV Preservation. We may take on a little tourism if we get bored but all in all, we have a great time on all of our projects. We did get some above water photos. Click Here to see the photo Album of the event. If any member would like to join us for ANY project in the future, you should register for the project we sent up in the winter and make available for you the member to participate. Please don't hesitate to try joining us on a project. You will have a great time. Both Men and Women have joined us this year and in the past. They all say they will be back. Some return and some don't. Time is what most of us come up with for an excuse. But, you will never be disappointed that you joined us. Have a great day and be sure to keep diving, even if it isn't with us! The Thomas Wilson Invasive Species Monitoring Project was once again Canceled. On Saturday we cruised the RV Preservation Research Vessel to the Thomas Wilson Shipwreck site and attempted to make a dive and discovered that the visibility was only one or two feet. The GLSPS safety protocol for dive projects is visibility needs to be greater than eight feet. The dive was them called. The GLSPS always has a backup plan. The crew and Captain decided to make a day of it so we all decided to motor out farther to dive the Mayflower and to see if the visibility was better at that location. It took a little to find the shipwreck. We didn't want to hook the shipwreck with our anchor and cause any damage to the delicate shipwreck so, we located the it using our side scan sonar and then dropped divers off that would like to dive. After the dive we cruised back to the Spirit Lake Marina and had dinner at a local restaurant. We then discussed our next plan for Sunday. When viewing to the weather on our smart phone we were seeing that Sunday wasn't going to be any better for diving. If fact it is turning out to be worse with up to 30 MPH winds gusting to 40 MPH. Since the weather and visibility was not going to cooperate with us on our last project of the year, we just loaded our dive gear and headed for home. Phil K and Tim P stayed up in Duluth to prepare some things on the boat for winter layup and since it was scheduled to be pulled out a week later. After getting some of the winterizing completed both Tim and Phil drove to Canal Park in a vehicle to see the waves coming into the Duluth Entrance. They were quite large and we both were thinking that we are glad we were not out in it! It was a harsh ending to the GLSPS Projects for 2018. But we did have fun with many other projects scheduled for 2018. If you haven't had the opportunity to join us on a GLSPS program or project, please check our schedule next year and register ASAP. Please remember, all members are invited to join us. Non divers are welcome as well. Although they are limited to which projects they can be on but, still welcome non the less. Thank you to all that joined us on the Thomas Wilson Invasive Species Monitoring Project. We apologize the projects had to be canceled for both weekends but, the weather and visibility are two things we cannot control. Have a nice fall and winter season and will see you next year on a project.